It’s that time of the month again when your body shakes in pain and the only way to get through those excruciating days is through keeping yourself clean and taking care of not having leakage. Imagine for a second you’re profusely bleeding, but the only means to stop the blood is a dirty rag or a piece of cloth. As unsanitary and unhygienic as this sounds, this continues to be the harsh reality of women in developing countries. Sanitary pads which a basic needs, has become an optional need for the women in the rural parts of India. The reason behind it is juggling monthly expenses, and the price of sanitary pads being nearly unaffordable for many. Women in the rural part of India, which are considered to be poor are forced to turn to unsanitary ways to handle their menstruation. The financial burden is only one of the many costs that surround women menstruation. In India, societal stigma also burdens women and ultimately limits their voice in said matters. Women are made to feel ashamed and subsequently remain silent on many issues. Few voices speak loudly and unwaveringly about the unfair costs of sanitary pads. Moreover, some women are hesitant to buy sanitary pads from pharmacy shops since they are employed by men, and others simply do not have accessibility to sanitary pads. Recently, one man –against all the norms and social stigma– advocated for change across rural India. Unexpected but nonetheless much needed, he sought to innovate the taboo subject of women’s menstrual pads. 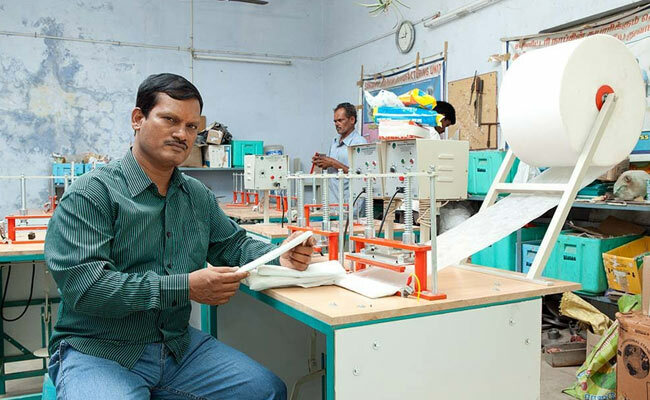 Arunachalam Muruganantham hails from Coimbatore of Tamil Nadu in India, he is the inventor and visionary behind the low cost and comfortable sanitary pads for poor women, especially the inhabitants of rural areas. It all began in 1998, Muruganantham discovered the unhygienic and unsanitary practices his wife endured during her menstruation flow; filthy rag cloth. While it is known that many other women adopted the use of newspapers, ashes, leaves, and mud. Muruganantham puzzlingly asked that if there were sanitary pads available then what was the need to adopt such usual practice, to which she replied that if every woman in the household began to use sanitary pads, then they would have to cut the families milk budget. It was not only a question of accessibility but also of affordability. Experiment and research began, Muruganantham bought a pack of sanitary napkin from the chemist shop, he took apart the pad and examined the material used in producing the sanitary pads. The cotton weighed less than 10 grams in a pad. 10 grams of cotton is worth approximately 10 paise (10 American cents), a steep climb from the cost in the store. The clear mismatch between production and retail prices came down to multinational corporations, who charged 40 times more. This steep price only created barriers for women like Muruganantham wife to afford these pads on a monthly basis. Sanitation became a luxury in such an unfair market. The design was simple enough, create cotton pads of the right size. This, however, proved to be easier said than done. He bought cotton and began to design experimental pads at a reputed mill. He bought his first designed sanitary pad for Shanti, his wife, and immediately asked for feedback to which Shanti retorted that would be impossible since period came once a month and therefore he would have to wait. He understood, waited until 15 days and finally got a feedback, which to his dismay Shanti rejected his creation and voiced her preference for the usual practice she practiced. Realizing that depending on one person for feedback would nearly take him decades in perfecting his creation and bring it to light, he decided to pursue other women for feedback. He needed female volunteers to give him feedback, now we are aware that there a distinct line in what is shared between men and women and definitely the topic of menstruation is taboo and has a lot of stigmas attached to it, so getting feedback from women was a far-fetched idea. Muruganantham believed that it was worth giving a try. He approached medical college girls at their hostel, convinced them and provided them various experimental napkins and waited for 4 to 5 days to get feedback until he realized that the barrier was still intact. Ironically those who are to become future female doctors were not ready to discuss their feedback with an elderly man face to face. Went as far to provide them with a feedback sheet with specific question which will aid him in evaluating the napkins and improving the quality per women preferences, only to notice a week later that out of the 20 girls only 3 filled out their sheet with honesty while the rest made the 3 girls fill out their sheet for them, resulting in false feedbacks. Muruganantham understood this was not an easy task, it was beyond what he imagined and this all due to the negative discourse of stigma and stereotype that has bounded the topic of menstruation. Further, Muruganantham faced one obstacle after another. First, his wife left him for several years and later his mother left him due to the humiliation that they faced in the society for the reasons for his creation of napkins. His mother believed that he was under black magic, while the whole village began to believe he was mentally unstable. He was scrutinized and ostracized by the society, he was regarded as a pervert. Menstruation already being a taboo subject, and for a man to meddling in such affairs was totally out of question. Muruganantham went far as to become the first man to wear a sanitary pad. He produced an artificial uterus made of a small ball filled with animal blood which is then connected with tubes and placed it in his underwear, and while walking or cycling he would push the pump a dose that would then land in the napkin. Muruganantham was not satisfied with the results and wondered as to why his cotton pads were not working when he was specifically using cotton similar to the ones produced by multinational corporations. Months passed, it was not until in the second year he finally discovered that the material used in the commercial pads were fabricated with cellulose fibers which derived from the bark of the tree; wood pulp. Muruganantham constructed a machinery innovation to further achieve his initial innovation, he devised a low-cost machine which then produced his pads. Today, his machine has been distributed around the Indian states and especially in rural areas which have aided in the creation of employment for local women and has made it easier for the accessibility of sanitary napkins at a low cost. Muruganantham’s great contribution to a cause and a taboo topic has opened a discourse in the society to spread awareness on menstruation. To further bring a light to Murugananthams’ innovation and his strong determination and recognition for his creation, his story has turned into a biographical film name “Pad Man” starring Akshay Kumar as Muruganantham, who portrays his life and has come about with the innovation. While people of the rural areas adhered to old customs, Muruganantham crossed the threshold and believed in destructing the barrier in order to bring change. As a man, Muruganantham not only thought about his wife, mother, and sister, but the women of the nation. He witnessed the lack of awareness and the poor menstrual care, and as a man, he believed that he could bring change. Even if crossing the threshold meant facing scrutiny and being outcasted by the society. Muruganantham strong dedication to move forward with his innovation and turn into reality was a step to breaking the taboo and the stigma entwined around the discourse of menstruation. He not only pushed against societal customs but has opened up space for women to feel safe in voicing out their concerns and needs. It an indication and a step towards a progressive movement, The more people become open and understanding towards this taboo topic, it will more begin to diminish the stigma around it. Demanding for basic needs such as sanitary napkins at a reasonable price should not be a taboo topic. Demanding for the accessibility of sanitary napkins should not be a taboo topic. Muruganantham perseverance shows that one can achieve anything by breaking barriers and not seeking societal approval. Passionate about politics and current events.